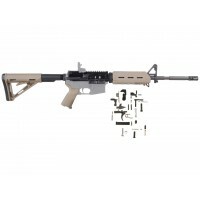 AR-15 5.56/.223 16" M4 Tactical Rifle Kit with 15" Keymod Super Slim Handguard contains all components to complete your AR-15 Rifle build. The rifle kit comes WITHOUT 80% lower receiver. All options and modifications to your kit are available on top of this page. Upper and 80% Stripped Lower are made from 7075 T-6 Aluminum. All components are Mil Spec and made in the USA. Barrel: 16” M4 government profile Chrome Moly with 1:7 twist, M4 Feed Ramp, 5.56 NATO, phosphate processed with a carbine gas system. Barrel is finished off with 15" free float super slim keymod handguard and muzzle brake. Upper: 7075-T6 M4 upper is flat top, precision machined and hard coat anodized. These uppers are made for us in the USA by a mil-spec manufacturer (DPMS style). Bolt Carrier Group: M-16 5.56/.223 complete bolt carrier assembly, chrome lined, made from 8620 steel. Bolt is made from 9310 steel and stalked per mil spec. MPI Tested. Comes complete with cam pin, firing pin and firing pin retainer. 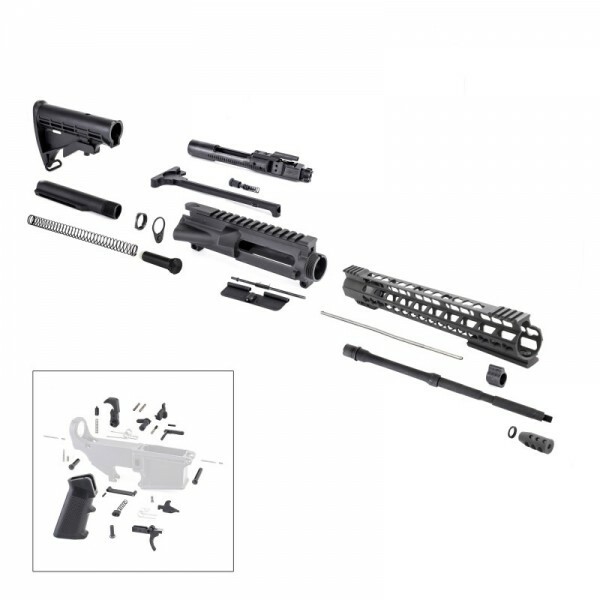 Lower Build Kit: Classic DPMS AR-15 lower parts kit, Mil-Spec. Includes everything you need to turn your 80% stripped lower into a complete lower. 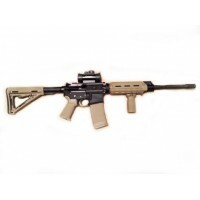 Stock: M4 LE carbine 6-position black stock, Mil-Spec. Completed with AR-15 buffer tube assembly and spring. Please Note: Comes unassembled. Standard kit is DPMS compatible. Also fits perfectly with Poly (DPMS style) lowers. Barrel may come in with 1:9 twist, depending on stock availability. For NY/CA compliance, we can modify the kit based on your preference with Featureless Stock Kit. 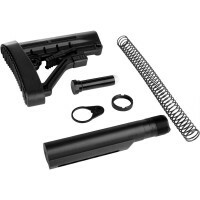 This rifle kit is not an FFL item - some machining is still required on 80% Lower Receiver. Stock photo for illustrational purposes only. Does not come with sight tower.